Cropcircles are beautiful. Mathematical shapes in nature crop feel surrealistic and that appeals to me. The cropcircles are a riddle and I try to solve that riddle. I tried so from the beginning, for me that was somewhere in 1983. This site tries to show how cropcircles, or parts of cropcircles, can be created by electric and magnetic forces. I don’t say all cropcircles are made this way. I even don’t say any cropcircle has ever been made this way. 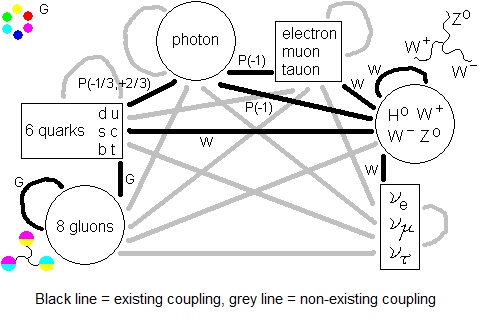 But even when none has been made this way, the shown electric and magnetic principles should still be possible. This is an electromagnetic adventure in the unknown, full of doubtful characters. Using the laws of physics (a lot of Lorentz force) I create things in your mind of unestablished existence like the Ordinary BoL, the SuperBoL and the Fractal BoL. (”BoL” means ”Ball of Light”.) As usual I don’t calculate anything. If you have some education in classic electromagnetism I invite you to follow me on the long road I have gone. The basic idea all over this site is that a magnetic field concentrates ions at one side of the crop stalk (in the horizontal plane, I mean). In the rest of this page I want to give two ways how this can make crop to flatten. It is not by pushing to the stalk until it bents. I don’t mean a mechanical agent. 1) The fastest thing, first to occur, certainly is the radiation-event. Originally the idea was that microwave radiation at one side of the stalk make water molecules in the stalk to rotate which immediately converts into heat (magnetron-effect). 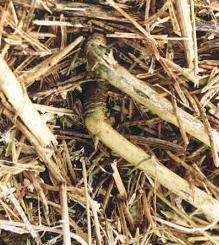 The water inside the crop starts to steam, which exerts an expanding force on its environment. 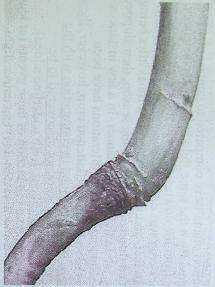 The stalk at the radiated side enlarges and the stalk bents, mostly at the nodes. This was promoted by the BLT Research Center. 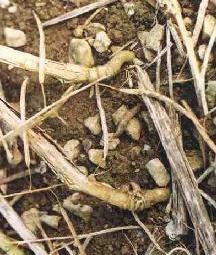 It uses no ion concentrations at one side of the stalk. Regarded the often-observed blown nodes in downed crop, this way - this kind of way - certainly works at a number of circles, if not at all. A more advanced adaption of this idea is the following. Then a horizontal E or M force (in nearly all cases in this site we go for the M) concentrates ions (any kind of ions) to one side of the stalk. The negative ions then all go to one side, the positives go to the opposite side in the horizontal plane. Every kind of ion always has one specific set of radiation wavelengths to which it is sensitive. All other wavelengths, shorter as well as longer, will pass through without affecting. 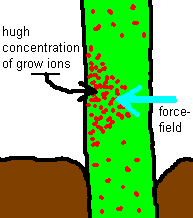 The negative and positive ions in the crop will usually be different kind of molecules that are affected by different sets of sensitive wavelengths. A source of radiation (not necessary microwave radiation) of one wavelength then will affect only one kind of ions: a kind at one side of the stalk or at the other side. The affected ions start to vibrate which immediately converts into heat that heats up the water molecules in the direct environment. 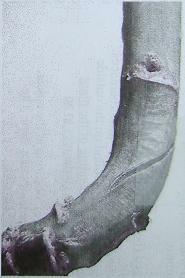 Expanding steam then enlarges the stalk at one side which urges the stalk to bent. So the radiation goes through the stalks until it meets its sensitive molecules. The radiation source does not have to be at the side where the ions are concentrated. Any side will do. And any radiation to which the ion is sensitive will suffice, not only the well-known microwave wavelength. 2) The second, much slower influence to occur after the radiation, is what I call the asymmetric grow-pulse. I got this idea before I heard about the eyewitnesses who saw cropcircles form in seconds - rather seconds than minutes. Like the 1996 Oliver’s Castle video that showed the forming of the snowflake formation. Six, seven seconds, isn’t it? 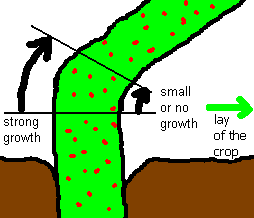 d) Actual grow starts when a certain density of growmolecules is achieved, at a certain location in the stalk. Below that density nothing happens there: a biological build-in threshold, to prevent continuous grow when unwanted in the presence of grow-molecules. Neither way is very convincing. 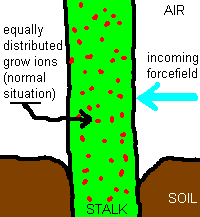 Despite this we will pursue ”ions pushed to one side of the stalk” as our basis of crop downing. In the next page I want to show an agent causing the mentioned E or M forces and maybe the source of the electromagnetic radiation.